Adsorption by active carbon is the most cost-effective way to treat waste gas streams with low contaminant concentrations. Conventional active carbon adsorption systems are easy to use and cover a wide range of applications, but these advantages are contrasted by the imminent danger of self-ignition and the carbon’s low efficiency with highly volatile compounds such as methanol. Plus, active carbon is an unpleasant material to handle. KATASORB™ A is a wholly new adsorption system. With KATASORB™ A you enjoy the advantages of adsorption without having to accept the drawbacks. During material processing or through the use of solvent-containing chemical products, volatile organic compounds (VOC) are released. This applies to the handling of solvent-containing mixtures as well as to the processing of plastics or wood. A waste gas stream, of which the contaminant concentration falls between the suitable ranges for either adsorption or combustion, can be treated with KATASORB™ K in a convenient and cost-effective way. With the help of a catalyst, KATASORB™ K lowers the energy demand of the combustion process. During material processing or the use of solvent-containing chemical products, volatile organic compounds (VOC) are being released. Numerous branches in crafts and the manufacturing industries have to deal with this issue. Due to an increased environmental and health awareness and more stringent regulations, the emission of VOC must be reduced. 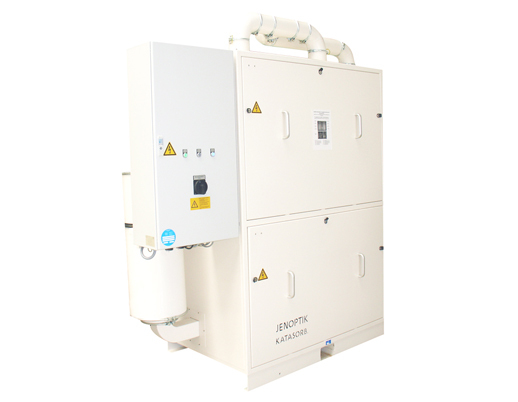 KATASORB™ Z offers a waste gas purification method that combines the advantages of adsorption and catalytic combustion into one system. 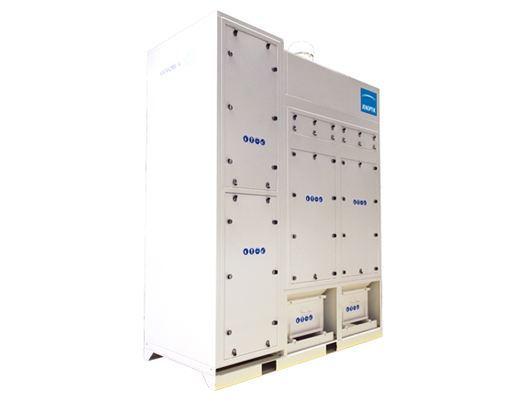 KATASORB™ A covers waste gas streams up to 6.000 m³/h. Each system is designed individually. A particle filter can be added. In addition, PURATEX can be used instead of active carbon or in an adsorbent combination. The system can be designed to accommodate future expansions. For low loads and/or inorganic substances: KATASORB A is a coal-based adsorption system for exhaust treatment which has a number of important advantages over conventional activated-charcoal systems. The system does not need any peripheral equipment for desorption. It integrates smoothly into laser treatment plants. The adsorbent is enclosed in cartridges which are changed as a whole: no mess, no dust, no health hazard. Each system is designed separately, taking into consideration the details of the waste gas situation and the conditions on site. Long-life adsorbent, no regenerate to dispose of, low energy consumption on account of small pressure drop and operation at room temperature. Can be integrated into existing control systems. Modular, flexible and expansible design, different adsorbents to choose from, including the chemisorbent PURATEX: KATASORB™ A fits changing requirements. Activated charcoal adsorbs a wide range of compounds. Through the thin layers the heat of adsorption is carried off effectively: The danger of self-ignition is averted. For every branch in crafts and industry that makes use of chemicals or works on materials: laser processing, chemical production, coatings, surface treatment and many more. 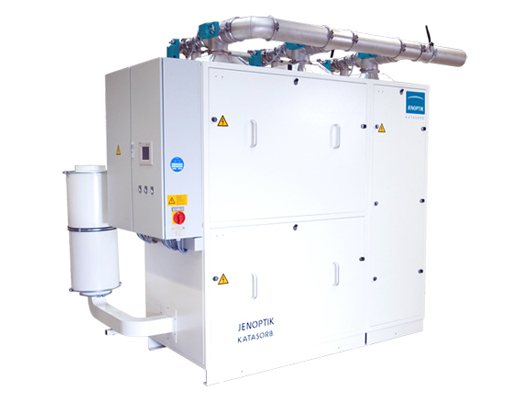 For higher loads of volatile organic compounds: KATASORB™ K If the exhaust carries a high VOC load, the catalytic afterburning unit KATASORB™ K is used. The heat of combustion supplies most of the required energy input. A number of catalysts are available for different exhausts. If necessary, a robust metal oxide catalyst can be used instead of the more sensitive precious metal catalyst. Long life, no waste diposal costs, low energy cosumption, no additional clean gas treatment required: KATASORB™ K is the most reasonable way to treat waste gas streams with higher VOC concentrations. The system can be integrated into existing control systems and machinery. It is assembled according to the available space. The reduction of VOC to regulatory threshold levels takes place at low temperature, without formation of dioxins or nitric oxides. Every system is designed separately according to the conditions on site. This ensures maximal efficiency at minimal costs. The modular system allows easy adjustment to the conditions on site. Different catalyst types will fit the system perfectly to the waste gas composition. KATASORB™ Z organic - Purification of VOC-containing waste air. KATASORB™ Z acid - Especially for waste air containing acidic fumes. For medium loads of volatile organic, including acidic, compounds (VOC): For the KATASORB™ Z process, one or several adsorbers operating in alternate mode are provided upstream the catalytic afterburning unit. This combined method is responsible for the low operating costs of the KATASORB™ Z unit. The system pays itself off quickly, typically after 1–2 years. VOC are disposed of completely by catalytic combustion. Modular, flexible and expansible design, easy to use. Can be integrated into existing control systems and machinery, e.g. into a laser welding device. Stationary waste gas streams are purified to comply with regultory or healthy threshold values at minimal cost.